We aim to give our clients a distinct advantage. Our stock both male and female must be fertile and reach puberty early. We breed productive females with the ability to raise a calf well under extreme conditions. Structural soundness, walking ability, do-ability, being able to forage and survive in a harsh environment are essential criteria for all our breeding stock. Their progeny should perform efficiently in all circumstances and for all markets. 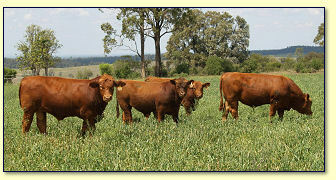 We constantly use new genetics and produce industry acceptable stock for our clients. The truth is that commercial cattle are still sold by the kilo and the Norolle bulls breed on the kilos! © 2017 Norolle Cattle Co.